An Iraqi soldier guarded a position in western Mosul Sunday during the battle to retake the area from the Islamic State. MOSUL, Iraq — Iraqi forces, backed by heavy US-led air and artillery strikes, have begun a new offensive into the Islamic State’s final bastions in the city. Iraq’s Joint Operations Command said the operation comes after Iraqi troops have cleared most of the western parts of Mosul, leaving a small number of Islamic State fighters spread across a handful of neighborhoods along the western bank of the Tigris River. The attack began Saturday and involved several Iraqi units assaulting across a broad front in an effort to overwhelm the Islamic State’s defenses. After nearly eight months of fighting, Iraqi forces appear poised to retake what was once the Islamic State’s largest stronghold in Iraq and the birthplace of its caliphate. Fighting, especially in the city’s west, has been ferocious, leaving Iraqi forces with thousands of casualties. Civilians too have been caught in the crossfire, leaving hundreds of thousands displaced and thousands dead. The Iraqi forces are trying to recapture Mosul’s Old City from three directions. Hours after announcing the push Saturday, the government said two military officers were killed in clashes in the Shafaa neighborhood on the Tigris River, the Associated Press reported. On Sunday, the advance of government troops slowed, two Iraqi military officers said. ISIS militants have deployed snipers, suicide car bombers, and suicide attackers on foot, the officers said. They described the advance on the Old City as ‘‘cautious’’ and the clashes on Sunday as ‘‘sporadic’’ without giving details on casualty figures from either side. The troops captured Ibn Sina hospital, part of the sprawling medical complex in the Shafaa neighborhood, the officers told the AP. They spoke on condition of anonymity in line with regulations. Even though the Islamic State now controls only roughly 5 square miles of the city, Iraqi and US commanders have cautioned that the worst fighting has yet to come. From his small patrol base north of the city, Army Captain Devan Zimmerman said the US-led coalition has provided a significant number of air and artillery strikes for the operation. Zimmerman, who helps advise a brigade from the Iraqi Ninth division, said forces had made some gains. Yet with such a small amount of the city still held by the militants and so many Iraqi forces attacking at once, Zimmerman said it will difficult to marshal and coordinate US-led aircraft in the airspace over the city. ‘‘This isn’t going to be quick,’’ he said. Along with the militants still in parts of the city, tens of thousands of Iraqi civilians remain trapped in their homes, creating the potential for a humanitarian catastrophe if they’re not evacuated safely. On Friday, Iraqi forces dropped thousands of leaflets over western Mosul, telling those in their homes to flee. The move is an abrupt shift from past instructions that have mostly told civilians to stay in place until the fighting is over. Aid groups cautioned the Iraqi government, saying that its forces must ensure that escape routes are protected before civilians leave. Checkpoints outside the city have seen a surge in civilians trying to get out. The United Nations has estimated that roughly 200,000 civilians remain in Islamic State-occupied neighborhoods and that 10,000 have begun leaving a day. Iraq’s prime minister had originally pledged Mosul would be retaken by the end of 2016, but it quickly became clear ISIS planned to draw out their inevitable defeat, leaving destruction and human suffering in their wake. Several factors make the remaining battle difficult, including difficult terrain, and the large number of civilians. 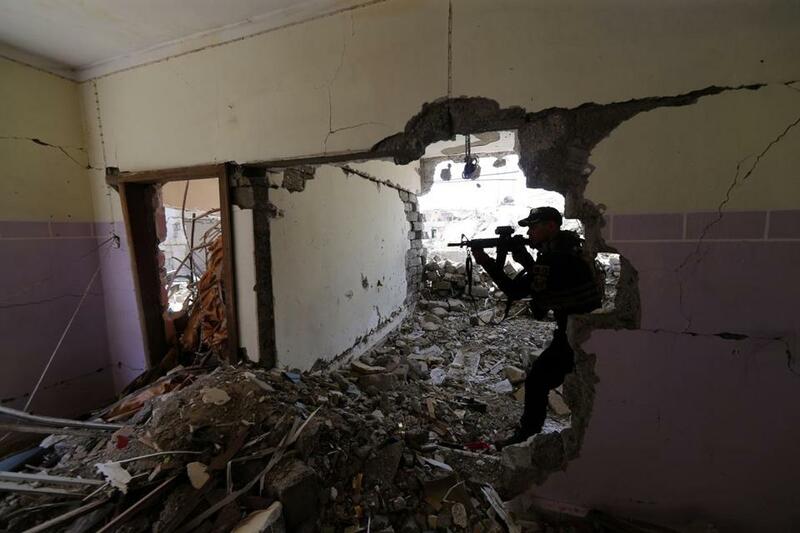 ISIS snipers fire down on advancing Iraqi troops from bedrooms, perched on rooftops, and from the minarets of mosques. Barricades erected by ISIS have turned residential blocks into mazes and the extremist fighters have used civilian garages to conceal massive, armored car bombs. Initially, Iraqi forces punched too deep into Mosul too fast and suffered heavy casualties from the ISIS fighters who knew the terrain and had years to prepare defenses. When Iraqi forces slowed their advances to just a few hundred yards a day and coordinated moves across multiple fronts, ISIS defenses thinned and Iraqi forces were able to secure more victories and reduce military casualties.